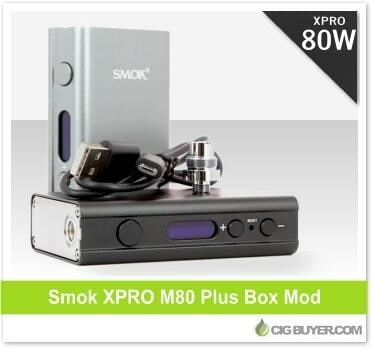 The Smok XPro M80 Plus Box Mod is the latest and most advanced device from Smoktech. It’s packed with power (up to 80 watts) and has two built-in 18650 LiPo batteries providing a HUGE 4400mah of capacity. It will fire as low as 0.1 ohms and can be operated in either Variable Wattage Mode (adjust watts from 6-80W), Mech Mode (bypasses the electronics for purely mechanical operation) or Temperature Control Mode (regulates certain atomizers from 200 to 900 degrees).